The final judgement in EU Cookie Law. The European Cookie Law requires all websites and online shops to get consent from their visitors to store cookies. The Cookie Lawyer app will do exactly that for you. 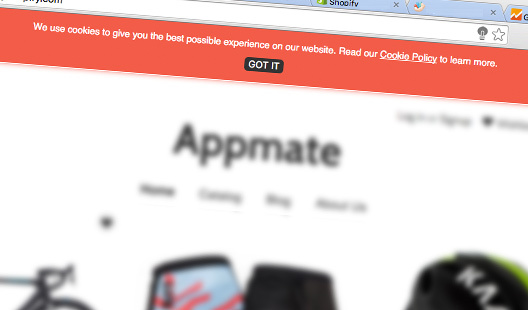 It will automatically display a cookie notice to all visitors from EU countries to make your shop cookie law compliant. There have already been cases where store owners got fined for not notifying their European customers that cookies are being stored. Don't risk it, hire our experienced Cookie Lawyer today. Cookie Lawyer will seamlessly integrate with your store's design, ensuring that this app will completely blend in with your company's unique look and feel. Advanced users and Shopify theme designers can customise Cookie Lawyer without any limitations. 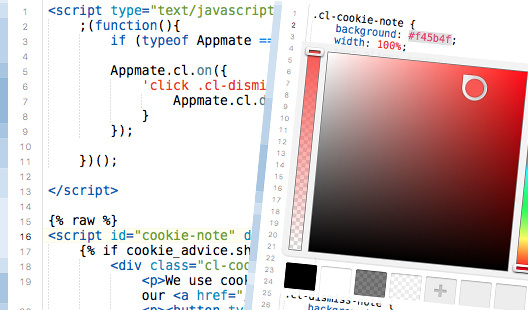 Appmate templates can be edited via the familiar Liquid template markup. Easy semantics and an extensive documentation will make your job a walk in the park. We believe everyone should be able to power their Shopify online store with our Apps. That's why we offer more affordable pricing for smaller shops, as less traffic also means less resources used on our servers.